James Richards Sketchbook: Jim to Teach at 2017 USk Symposium in Chicago! SKETCHBOOK: a creative tool and a way of life that celebrates design and drawing as vital ways to see and value culture, to discover ideas, and to envision a better world. Jim to Teach at 2017 USk Symposium in Chicago! The faculty roster for the 8th International Urban Sketching Symposium in Chicago has been released, and I'm honored to be among this elite group. The Symposium will be held July 26-29, 2017. 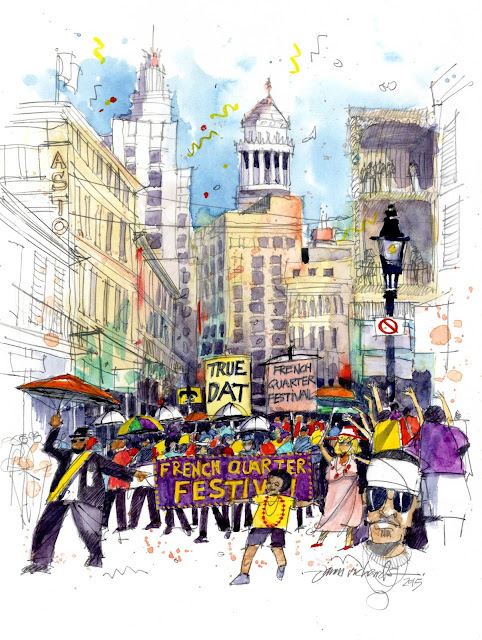 The annual event is the largest gathering of sketchers in the world; last year's symposium in Manchester, England drew 500 attendees from 44 countries. Workshop faculty are chosen each year by a panel of educators in a juried proposal process. My workshop will be offered three times during the symposium. It's called The Grand Illusion: Achieving a Dramatic Sense of Depth, where we'll focus on creating a convincing illusion of 3-dimensions on the 2-dimensional paper surface. Creating this illusion is the essence of location drawing, yet it's one of the most consistent sources of questions in my workshops and online classes. Abstract concepts will become clear with examples from the worlds of stage and film, followed by demonstrations of how those concepts can be translated to location sketching. Participants will learn a range of classic, foundational techniques that demystify creating a sense of depth, as well as a number of cool tricks I’ve learned over decades of creating believable worlds on paper. By workshop’s end, you will see city scenes in a different way, and will bring a new sense of believability to your urban sketches. See more details on the 8th International Urban Sketching Symposium HERE. I will see you there. I registered yesterday and am in one of your workshops. This is my first symposium and I'm so excited! That's wonderful, Joan...I look forward to meeting you! Same here! I had the alam set Saturday morning to gain early bird registration for the Symposium. Your workshop was my first choice - and upon first selection was sold out! I'm thrilled to have gained a spot though - I've enjoyed your book and Craftsy class and cannot wait to learn more in person! See you in Chicago! Really looking forward to meeting you, Steph! We'll have a great time! JAMES RICHARDS is an artist, urban designer, author and educator whose work reaffirms and elevates the value of freehand sketching in a digital age. He is a former professor of design and drawing, and an Advisory Board member, blog correspondent and instructor for Urban Sketchers. His on-location sketches and watercolors have been widely published, shown in group and solo exhibitions and seen on NBC Nightly News. His award-winning book Freehand Drawing and Discovery is a text in design schools worldwide. He is a frequent visiting artist at universities, and keynote speaker for conferences and symposia. 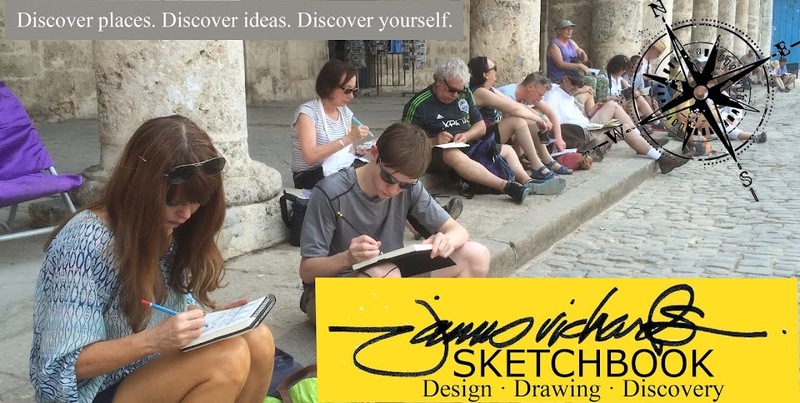 He travels globally to teach concept drawing and urban sketching workshops. Workshops for Washington State University!